January has started nice and slowly for me this year, work is easing itself in which is perfect, I take a while to readjust. I decided to book flights to London for the end of the month weekend break with a friend. I haven’t visited London in a few years so it would be great to experience all of the new food that’s popping up around the city. If you have any tips or recommendations I’d love to hear them, pop me a comment below. Anyway, This lunch is hardly a recipe but more of an idea or inspiration, like c’mon its a fancy fried egg! It can be quite spicy but I love a bit of heat in my lunches. I find this lunch (sometimes dinner) very comforting and very filling. If you have a rice cooker it’s really handy, I stick it on when I’m making my afternoon coffee and by lunch time I have fluffy rice waiting to be eaten. The chili can be altered to whatever you are comfortable with, I tend to top mine with a tablespoon of kimchi or a teaspoon of drizzled Peanut Rāyu for extra depth and heat. Start by cooking your rice, whether thats in a saucepan, or rice cooker. 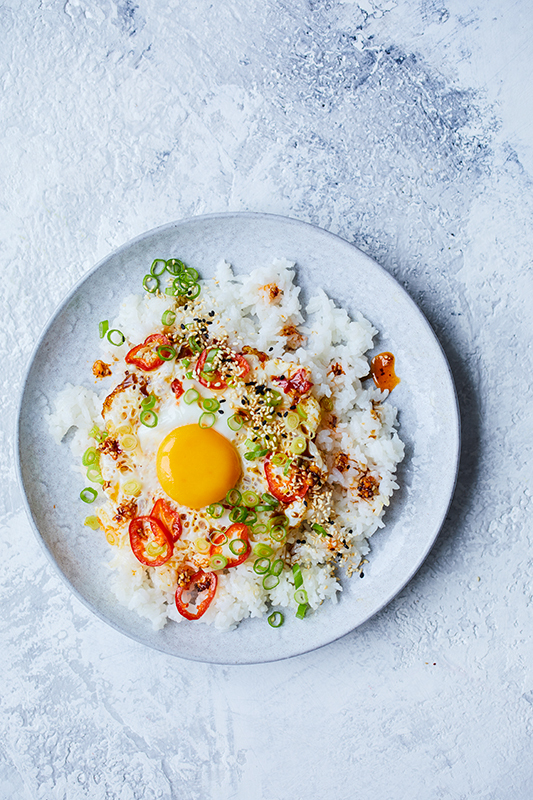 If you have left over rice from dinner the night before even better. Heat the rapeseed oil in a wok (frying pan will also work) over high heat and just before it begins to smoke add in your chilis and your spring onion (reserve a small amount for garnishing) they will start to pop and fry, add in your garlic and then your egg. You want the egg to cover all of the chili, spring onion and garlic. Fry until crispy but the yolk is still runny. Remove from the pan and place on top of your rice, sprinkle with the reserved spring onion and toasted sesame seeds. I would then drizzle with some peanut rayu and kimchi, but you can leave this as is. This looks amazing! And I am guessing I have missed your trip to London, have I? Shame – would love to meet up for a coffee! Yes unfortunately, that would of been lovely Bea, hopefully it won’t be so long until I’m over again!